Did I mention Holy Crap? Also, still major props to Beardy for at least attempting to reach out for her rather than looking dumbstruck like his brother Stubbles. This totally sums up my response. I honestly gasped at the last panel. OMG Panel 5 is the most amazing panel in all of web comic history. I squealed when I saw it. Coal just looks so swift and heroic. Haha! I dunno if I’d agree with you, but I’m glad it elicited that reaction. ;3 Thanks so much! Seriously, been some time since we last saw Coal. “Spanish and Moorish Fashions” by Tom Tierney. If you enter in your own location or simply repeat the search, that site will tell you the libraries closest to you that stock the book. If you’re really desperate and it’s not close by, I would suggest inter-library loan. Oh my gosh! This is like watching a super intense action scene from a movie one frame at a time. THE SUSPENSE IS KILLING ME!!! I’m so excited for the next page!!!!!!! Hahaha! I’m glad you find it so exciting. :3 Thank you! Is she holding the cross through her dress? Yes, she is! One last stab at hope. Wo-ah! Livin’ on a prayer! Uh-oh. Somebody’s gonna get wet! Hedda, your life is about to become infinitely more interesting. I guess super speed is under his control too? Also I would not be surprised if hedda totally falls for him, he is the dark, distant, hero type and he saved her. Very dreamy! Yeah, he’s gotten especially quick since drinking Odin’s beer. Pays to be dead sometimes, I guess. SUDDENLY, COAL, OUT OF NOWHERE! Hahaha! I wish I’d been there. Ummm…I squee-ed when I saw this page. It is squee-worthy. I can’t believe I have to wait till next Thursday for the next one…I’ve been following TMK for a few months now btw – LOVE IT! Hehe, 1st reaction reading this, “*Gasp* Coal’s back! !” second thought “…Coal, you are so short.. ^_^;” Tiny undead hero to the rescue, go go! This made me smile so much! My mom is always singing “Here he comes to save the day!”. Awesome job! mighty mouse, right? i hope mighty coal can fly too. by the way, awesomly epic! you never fail to impress. Haha, yep! Guess you’ll have to wait and see if he can fly. :3 Thank you! I totally thought “Here he comes to save the day!” before I read your comment. YAY! Haha, thank you! You must be psychic. Haha! If you figure out that time warp thing let me know. Sorry, I don’t know how to tiny URL. ;( But if you go to Google books and enter Spanish Moorish fashion, there will be other books that show up, too. I was not expecting that WHATSOEVER. Thank you! And yeah, it’s ridiculously difficult to find much info about non-Christian/European clothing sometimes. A lot of what there is was made later in history and through a veneer of romanticism. You just have to make the best of it and guess your heart out. eek! So glad Coal is coming to the rescue! As to your costuming problem I have to admit I am unsure of the dating of TMK but have you considered looking at what past directors have done with Othello? I know it would probably be over the top most of the time, but you might find some useful elements in there. Have a lovely day! I can’t blame Coal’s first response, but I’m pretty much interested in how exactly will he avoid the consequences – he’s just about to steal from Hel, and that’s not exactly wise. Odin won’t back him up, as he has a sort of agreement with Hel about not stealing the dead from each other (which he tried to violate twice, partially succeeded once – next time he wasn’t able to get even Baldr out, and didn’t dare resorting to serious threats, much less violence, and Baldr was his son). Remember people, the gods are real in the comic’s world, so Hedda’s planned sacrifice isn’t some meaningless crap – also the guys were pretty kind given the circumstances: in their eyes, she’s a slave (a property, worth less than an ox) and a Christian (the ones burning and destroying the sacred places and forcefully converting people – that is, if the comic takes place after about 500 A.D.). Trying to make it easier is a sign of kindness, whatever we modern people think about it. I had been pondering something like that as well. I keep wondering if Hedda would end up in her own religion’s afterlife (and if that would end up being Hell for having committed suicide?) or if she does end up in Niflhel for being a thrall. And this is me shutting up now, so I don’t babble on with my questions, eep. I tried ‘Moorish fashion’ in Yahoo search and got some good results. Search for clothing from about 700 to about 1500 AD to see how the styles evolved. Clothes were often made of wool with small-clothes under of linen (or silk, for teh rich). The Spanish finally kicked loose from Islamic (Moorish means Moroccan) governance and shortly after hired an English conquistador and Italian navigator to sail the ‘great ocean’ in hopes of finding a lower-cost trade route to China… He ran aground in Bermuda and that was the end of that era. Thanks for the advice! Also, I’m gonna take a chance and hope this isn’t spam. I did remove the URL from your name, however. If you google images for “Al Andalus” (instead of “Muslim Spain”) (plus “ropa” or “clothing” maybe) you will stumble with a bunch of Medieval miniatures and some other suggestive images. Also google images as well for “Moros y Cristianos”, which are Spanish festivals which celebrate Reconquista battles and for which people dress as in the Middle Ages for parades and ritualized theater. These are costumes and not necessarily accurate but may help with inspiration, I guess. 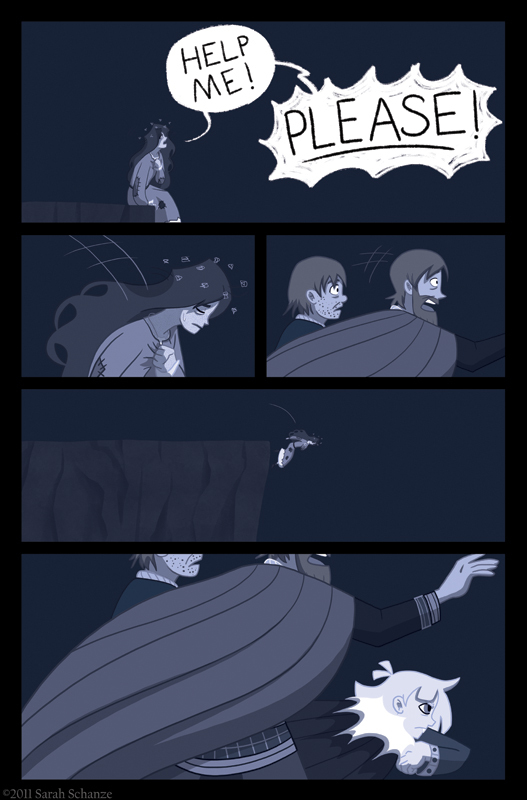 As for the comic, I had to go back to the previous chapter to remember the details of Coal’s last appearance. Oh wow, thanks for those ideas, Maju! I hadn’t thought of doing that. It’s okay if they’re not totally accurate, since it really is more for inspiration and getting a general feel for the clothing of the period. I’m not writing a dissertation or anything. XD Thank you so much! Ahhhh I LOVE this comic … it’s my favorite EVER! Thanks so much! 😀 I hope you continue to enjoy it. One word: yay! Haven’t read in a while but always love the webcomic. Simply love it. Keep up the great work. Thank you! It’s not a bad idea to just come by every few months and catch up on a bunch of pages. XD I’m glad you’re enjoying it! Awesome! 😀 I coudn’t wait for Coal to come back into view! I might have a couple of databases for what you are looking for, since I’m currently studying art history and have teachers who gather tons of images. What exactly are you looking for? As in, what era (approximately)? That might help me figure out what you’ll need. In the meantime, I’ll skimm through their stuff and see if there are any good figurative representations that could help you. Other than that, you could look for Mozarab and Mudejar clothing, although a neat way to figure out something probable would be to nail down your character’s origins. Depending on the era (beginning of the emirate, for instance, a time when everything was usually based on Syria because it was the emir’s homeland) or the char’s origins (Arab or Berber? If he is Berber, then look for regular Berber costumes: they have not changed over time but would differ depending on his tribe/region of origin), your character will have different clothing and accessories. By the way, I found some cool Viking/Al-Andaluz info that is related to Cordoba, which belonged to the Omeyyades (the Syrian emirs I was talking about).